The football World Cup is the most exciting sporting tournament for most football fans. Though like other competitive sports it has faced much criticism and scrutiny, but that doesn’t meant that children shouldn’t enjoy The Beautiful Game. If you put to one side the controversy surrounding FIFA and the often aggressive fans, the basic game of football is a wonderful sport to teach young children. It’s a team sport, it is great for exercise as it involves a lot of running and it requires determination to learn the required skills. Draw out/print pictures of all of the flags for the teams in the World Cup. Help your children remember which flag belongs which country and where that country is located. Why not teach your children a few basic words in the language of one or two of their favourite teams? Keep a score sheet of the points each team has won, every night encourage your children to add up the points of the teams to see who’s winning each group. Research the host country, Brazil, what is their main religion? What is their main language? How big is the population? Famous landmarks? Show your children lots of pictures and ask them to repeat your answers. 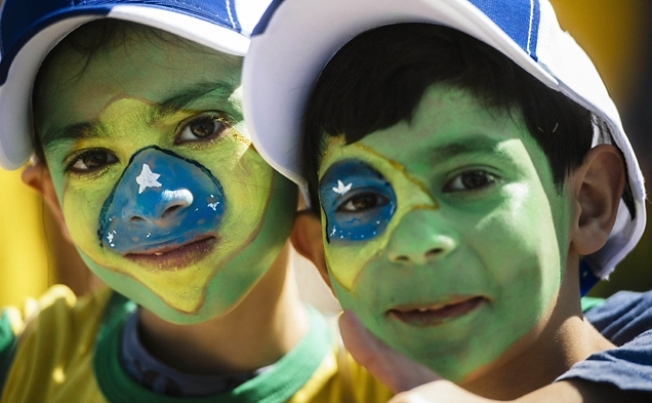 Did you know that the World Cup has taken place every 4 years since 1930 (except for a few years during WWII)? Research the history of the World Cup with your children, how is has changed and developed over the years. Where has it been held? What did those countries look like then compared to now? Let us know what team you’re supporting and if you’ve tried out any of these activities with your children. Sadly Canada didn’t make it through but there are numerous great teams playing who we will be supporting including England and France!